I’ve been slacking on meal planning lately, so I used some of my free time during Christmas break to put on paper my meal plan for a month. 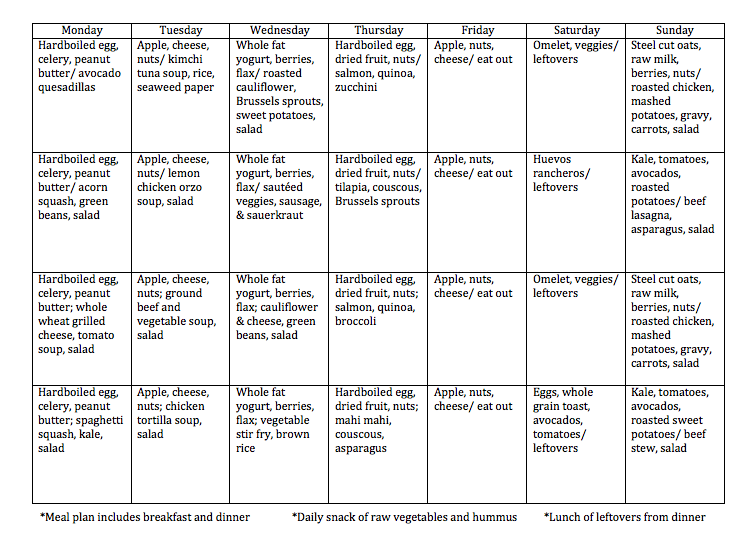 I could even use this same plan every month, so let’s just say I’ve made my meal plan for a year. Hallelujah! This plan works for me because it includes grab-and-go breakfasts and easy dinners during the week. Meals that need more time are planned for Saturday morning and Sunday. I cook meat on Sunday, and then I use the extra meat for a meal or two during the week. I eat fish once a week as well. I like to eat small portions of meat spread throughout the week in order to get protein and fat in my diet, without spending too much money or time cooking it. My favorite place to buy healthy meat is Real Foods Market and Whole Foods Market. I usually grocery shop on Saturday and then prep and cook a lot on Sunday. I try and prep as much as possible for the upcoming week on the weekend. I put all frozen meat in the fridge to thaw, wash and cut all produce for meals and snacks, and begin soaking any grains on the menu. Learn about the benefits of soaking your grains here. I try and have balanced portions of protein (palm sized), whole grains or starches (fist sized), vegetables and leafy greens (the rest of your plate), and non-processed fats in every meal. I like to make some salads with fruit, nuts, and cheese. It’s kind of like eating dessert. And others with lots of vegetables, hardboiled eggs, and beans. If your meal doesn’t have any protein in it yet, make sure to add things like beans and egg to your salad. Choose a full-fat salad dressing that does not include hydrogenated vegetable oil. That stuff’s bad. Healthy fats are a very important part of your diet. They keep you full and will reduce your cravings for processed sugar and refined carbs. Read about the best cooking fats here. I cook with real butter from grass-fed cows, non-processed lard, extra-virgin olive oil, avocado oil, and coconut oil. I eat food like full fat dairy, nuts, avocados, chicken broth, and salmon, which are all full of healthy fats. Having healthy snacks available is important. 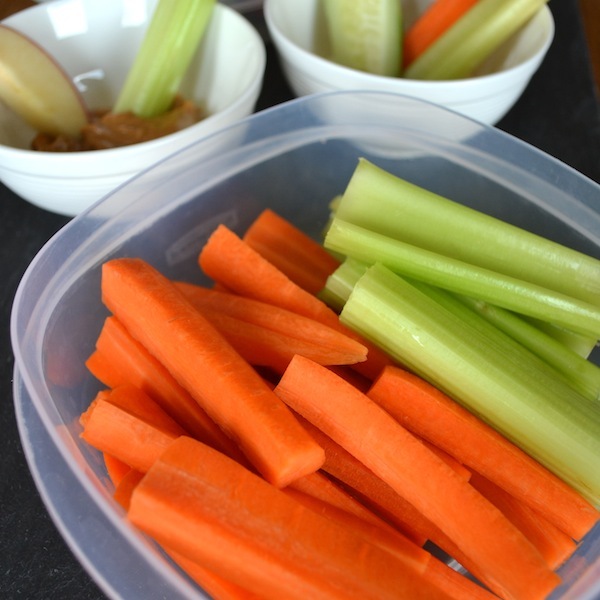 Prep raw vegetables (carrots, celery, snap peas, green beans, cucumbers, tomatoes, broccoli, cauliflower etc.) and dip them in hummus or cucumber yogurt dip; buy dried fruit and nuts; prep fruit (apple slices, grapes that are washed and cut into smaller clusters, cutie oranges, bananas, and pears) dip the apple slices in peanut butter or almond butter. Buy nut butters that have only the nut (and maybe some salt) on the ingredients. Once again, avoid the ones with hydrogenated oil and added sugars. Nuts have a ton of natural oil that’s healthy for you. You’ll have to stir it, but that’s worth your health, right? This plan is flexible. If you’re busy and stressed on Monday, go out to eat instead of cooking. All the meals just get pushed out a day. If you have more time during the week than on weekends, cook the more time-intensive meals on the weekdays. Everything in this meal plan that requires a recipe can be found on the blog. I hope this is helpful to someone out there. I know I’ll be eating better with my meals all planned out this month! Thank you for posting such delicious healthy recipes! Simple though it may seem, I especially love your creamy chocolate banana recipe.